Led by a nationally respected oncology nurse, the DigniCap clinical support team is available to patients and clinicians by phone, online, app, and in person. DigniCap achieved 66.3% success with taxanes in the U.S. clinical trial vs the competitor’s success rate of 59% with taxanes and 50.5% overall. 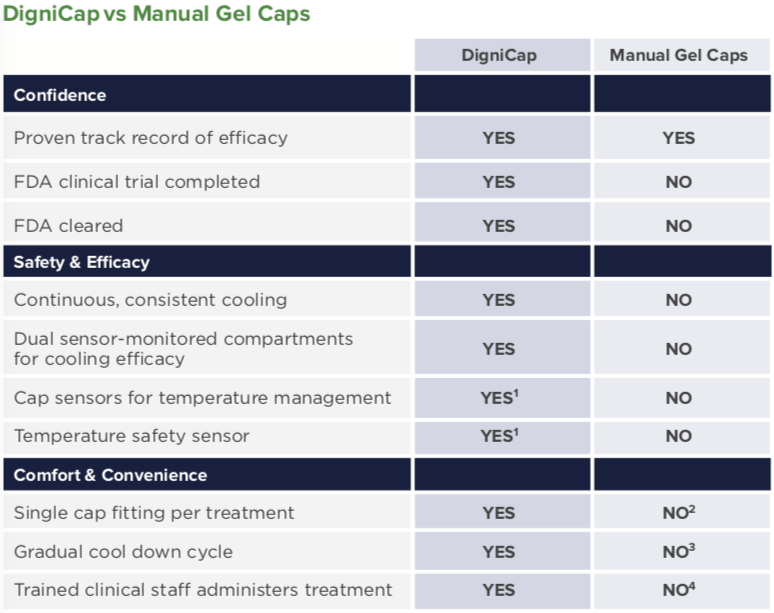 In 2015, DigniCap became the first scalp cooling device to receive FDA clearance. Expanded clinical indications from the FDA After an extensive review of worldwide studies, in 2017 the FDA expanded the clinical indication for DigniCap to include men and women with solid tumor cancers. Proactive promotion of your institution, clinicians, and patient stories to consumer and healthcare media. For more information on clinically superior scalp cooling with DigniCap click HERE.